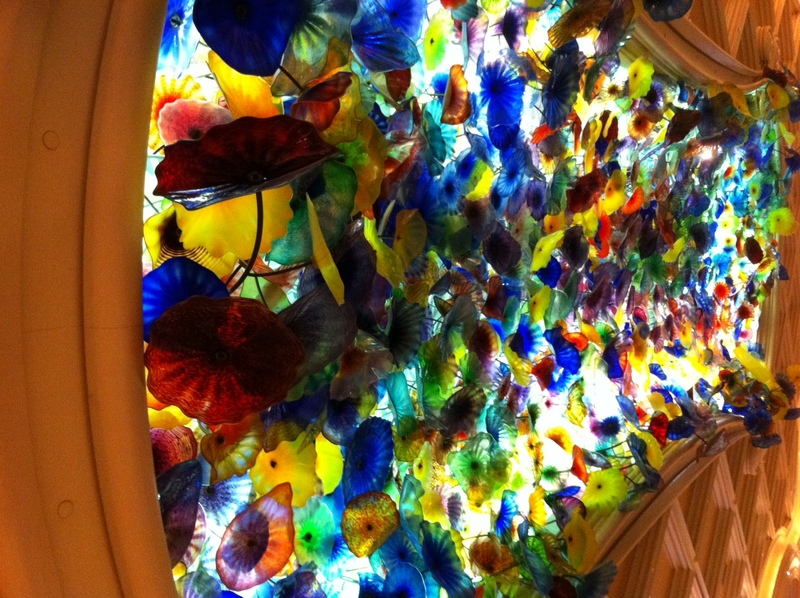 To do things up in Vegas style, you need a full Chihuly ceiling. 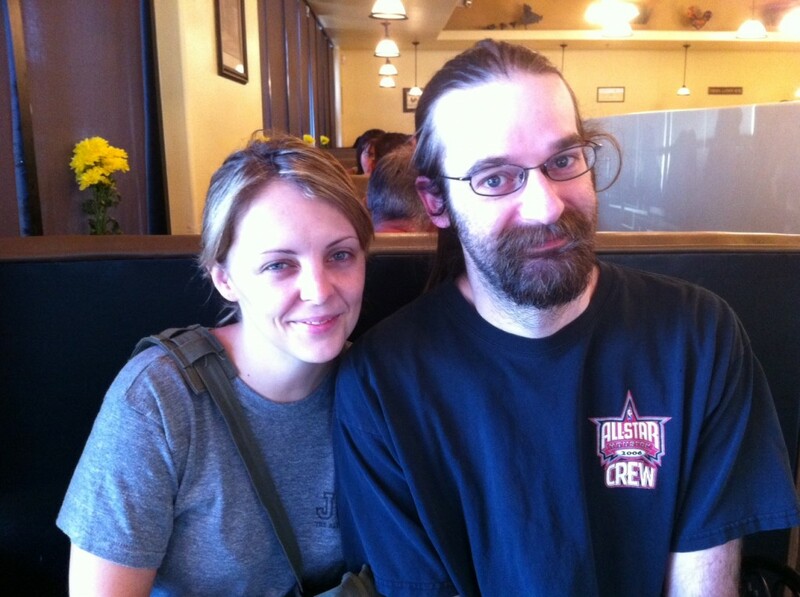 Las Vegas did not build all this glitter in the desert based on the wagering of the likes of my companion and me. We just spent five days in Vegas. I don’t think we bet $100 between the two of us. We did take in a show. We ate and drank at Vegas prices. We spent a night in a penthouse suite. 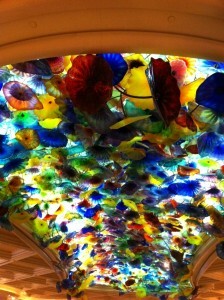 We took in the Vegas lights and sights, where even something as beautiful as Chihuly glass art must be done to excess. But this was mostly a business and family visit to Vegas. I attended a conference, as lots of visitors do. But when my day at the career fair was over, instead of heading for the casino, I headed for the home of my son, Joe, and his wife, Kim. Joe, who works at Mandalay Bay, where the Unity 2012 conference was meeting, reserved us a penthouse suite there for our 38th wedding anniversary. 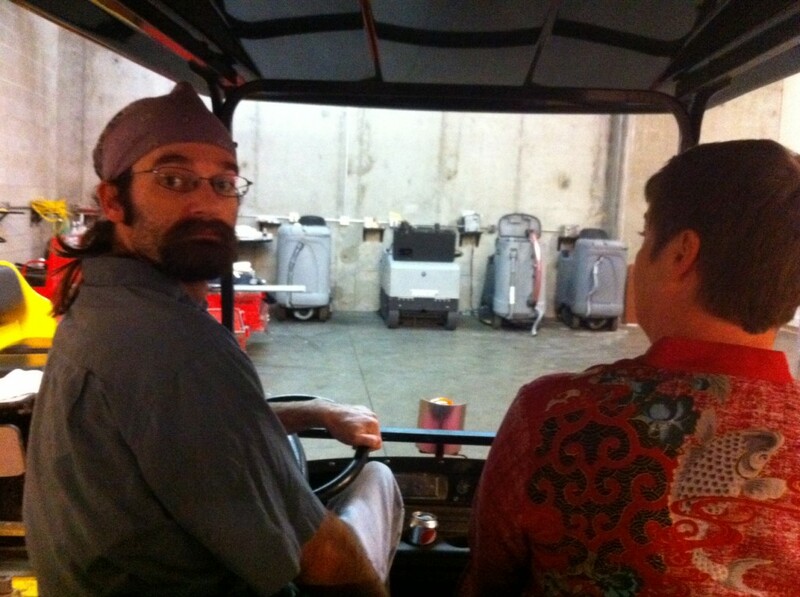 It’s a long walk from the conference center to the hotel, so Joe squired us around in a golf cart, through the service bowels of the complex. Joe backs up the golf cart, with my companion in the front seat. Kim, who works at Viva Elvis, got us tickets to O, another Cirque du Soleil show, and we enjoyed the aerialists, acrobats, divers and swimmers for an anniversary date. My companion, who hates clowns, even laughed at the clowns. A bit. But we didn’t drop a single nickel in a slot machine (my companion says they’re like vending machines that don’t work). We didn’t play a single hand of cards. I enjoy poker with friends (though I can’t remember the last time I played), but playing cards with strangers has little appeal. It’s not that I have a huge moral objection to gambling; I just don’t find it very entertaining most of the time. I did decide to put a few bucks behind my favorite pro sports teams. If the Yankees win the World Series, I will win a few bucks. If the Kansas City Chiefs win the Super Bowl, I will win a few hundred. If they both lose, I lost $20. My companion enjoys a little roulette, but she’s not a high roller, so Joe took us to the older casinos on Fremont Street, where we found a roulette table at El Cortez that took quarter bets. I came out $4.50 ahead. My companion lost the $20 she spent for her chips. But for us, the big win in Vegas is a visit with Joe and Kim. 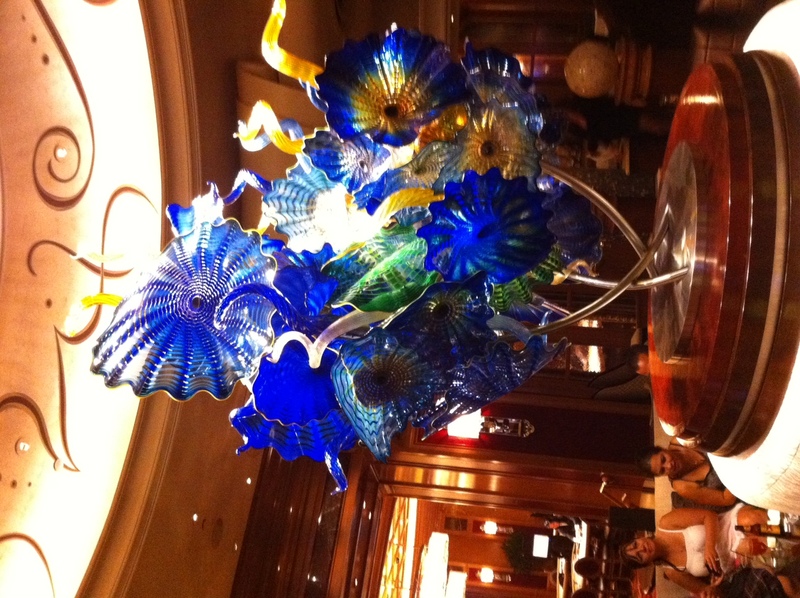 Here’s my companion’s Viva Las Vegas report. 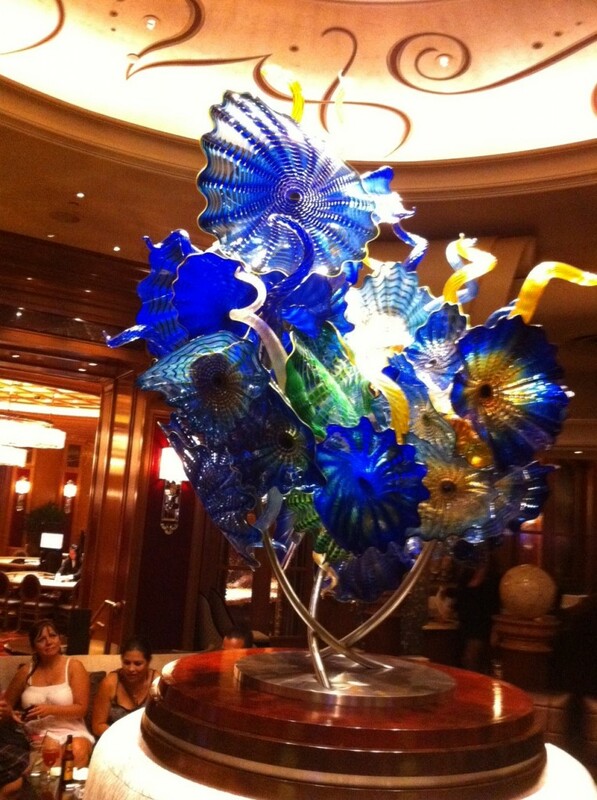 This entry was posted in Las Vegas and tagged Joe Buttry, Kim Bagby, Las Vegas, Mandalay Bay, O by stevebuttry. Bookmark the permalink.